How Do Transistors Work As Inverters? Electric current comes in two types: AC and DC. 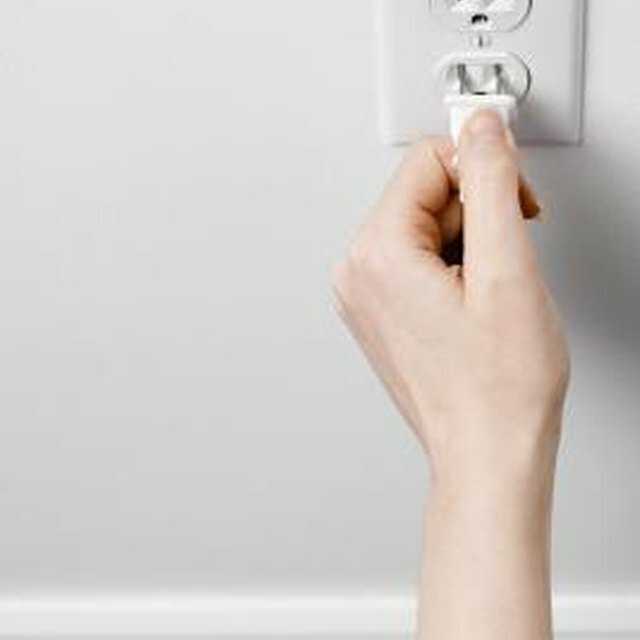 AC, or alternating current, switches rapidly from positive to negative and back again. It is used in power lines to transport electricity across large distances. DC, or direct current, power continuously flows in the same direction. DC power supplies provide power either straight from DC sources or else from AC sources that have been converted to DC. Batteries are a common source of DC power. A battery power supply is the simplest way of providing DC power. Batteries have chemical energy stored inside. When they are connected in a circuit, that chemical energy is converted into electrical energy, which powers the circuit. Batteries are all rated at a certain voltage, a measure of the amount of pressure the electricity creates in the circuit. They are also limited in the amount of amperage -- basically, the speed at which electricity can flow out of the battery -- that they can provide. Multiple batteries are wired in series to increase the voltage or in parallel to increase the amperage and the total lifespan of the battery pack. Series batteries are wired so that the negative terminal of one battery is wired to the positive terminal of the next in a line, whereas in a parallel circuit, all the positive battery terminals are wired together and all the negative terminals are wired together. For example, if 4 15 volt AA batteries are wired in series, they will produce 6 volts (15 x 4). If they are wired in parallel, they will be able to produce 4 times the amperage, or last for 4 times as long producing their normal amperage. Many electronic devices need DC power, but the electricity in power lines is AC. A rectifier circuit converts AC power directly to DC. A rectifier begins with a transformer. The electricity flows through a coil that is right beside a second coil of wire and an iron element called the core. The second coil of wire sometimes has fewer turns than the first coil, creating a step-down circuit: the voltage that comes out of the transformer is lower than the voltage that comes in. If the secondary coil has more turns, it steps up or increases the voltage. The output then goes through an electronic one-way valve called a diode. In a half-wave rectifier, electricity is only allowed to flow through the diode during the positive half of the AC wave. During the negative half, the diode closes. In a full wave rectifier, electricity is allowed to flow down a positive output during the positive half of the AC wave and down a negative output during the negative half of the wave. This creates two streams of electricity, one positive and the other negative. Initially, the electricity is very "bumpy" because it comes straight from an AC circuit. Other circuitry in the rectifier smooths it out to get continuous DC power. Many DC power supplies combine both batteries and rectifier circuits. For example, a computer power supply has a sophisticated rectifier in the power brick that takes AC current from the wall and converts it to very smooth DC voltage for the computer. This DC voltage charges up the laptop battery and powers the laptop. When the laptop is unplugged, it automatically switches to battery power until it is plugged in again. Similarly, the alternator in a car is a generator that produces AC power. This power is converted to DC and used to power the car's ignition, spark plugs, radio, air conditioning and other electronic systems, and to charge the car battery. The car battery, in turn, powers the starter motor and other systems when the engine is off, using the stored power produced by the alternator. Why Do My Lights Dim When the Neighbor's Air Conditioner Goes On? What Causes a Power Transformer to Hum?